Casual Fridays at the office can mean jeans and really dressed down or it can mean casual chic. I like to go with the latter. Chambray is the perfect way to dress up casual and still remain office appropriate. This outfit was super comfortable and added lots of color to an otherwise ordinary Friday. Now, I’m up on my feet all day so these shoes are not ideal for me, but I would’ve worn them if had a cute little office position where I could sit down most of the day. Soooo, instead I wore THESE aka the most comfortable shoes on earth. They made this outfit very casual and comfortable, yet cute. What do you think? How do you do casual Fridays? Top: J.Crew Factory (non-maternity) | Chambray Pant: Gap maternity (non-maternity option) | Sandals: (old) (cool option) | Bag: Urban Outfitters ON SALE! According to Q, you don’t have to limit yourself to jeans for casual Fridays. 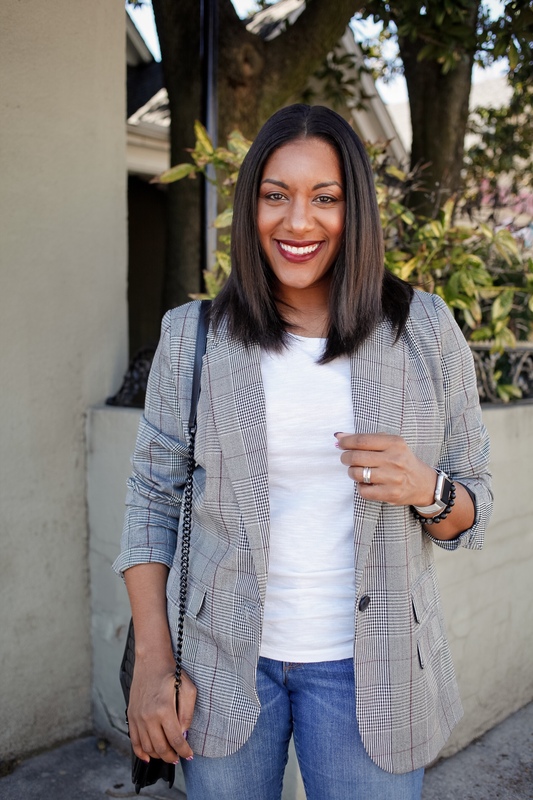 You can still be stylish and professional with tons of options to add a little fun to the office, like chambray and color. Add a little cheer to your outfit and your workplace! Cheers to adding a little fun to casual Fridays!